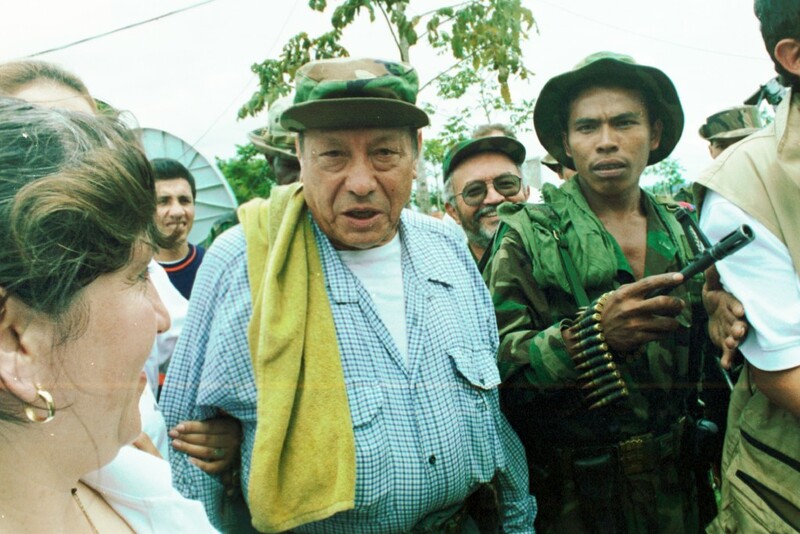 FARC founder, the late “Manuel Marulanda” in the “Distension Zone” in southern Colombia in 2000. “Marulanda” and 40-some campesinos formed the FARC in 1964. © Photo by Steve Salisbury. All rights reserved. The FARC has made clear that its goal remains being to achieve power, though it says that its future is to try to do so via the ballot box in an electoral system it wants to be fortified with measures “to level the playing field” and make amends for what it sees as political impediments or disenfranchisement. FARC leaders know that “armed struggle” won’t achieve its goal of winning power and is figuratively and literally a dead end where a smart bomb could fall on them in the jungle at any given moment. The FARC doesn’t see this as a defeat, because it has always said that its quest for power is a journey that has multiple components—including social, political, diplomatic, public relations, and until now military. Pres. Santos, who is from a wealthy family that once owned and is still connected to Colombia’s largest newspaper El Tiempo, calls the conflict “anachronistic” in a Colombia that in his view and that of many has dramatically improved since 1964 when the FARC’s late founder Pedro Antonio Marin, “Manuel Marulanda Velez,” and at least 40-some other peasants formed the FARC against what they denounced as an oppressive, abusive government and “feudal” system. In his 2014 reelection campaign Pres. Santos painted a rosy picture of an official inflation rate lower than three percent (now it is about 7.5 percent and felt higher on the streets with Colombia’s currency devaluation and the El Nino weather drought effects), and an official unemployment rate low by Colombian standards of between 7.8 and 9-something percent (still approximately in that range or a bit higher). But the FARC continues to underscore severe social injustice, especially for the marginalized “masses” of peasants and urban workers who eke out a miserable existence on a new 2016 minimum wage of the equivalent of about US 210 dollars per month, calculated at Colombia’s sharply devalued currency exchange rate at the time of this writing, and many earn less than that. According to the FARC, the peasants and lowest-wage urban workers have become “invisible” to most of the rest of Colombia. The roots of the FARC germinated in an era known as “La Violencia,” when an estimated 200,000 to 300,000 people were killed roughly from the late 1940s to the late 1950s as respective supporters of the politically dominating Conservative and Liberal parties carried out assassinations, massacres, and destruction against each other. As a FARC peace negotiator explained it to me, residual violence and abuses pushed the Liberal party-raised “Marulanda” and his coterie of campesinos to rebel. They complained of the stealing of their lands and livestock by large land owners in cahoots with Conservative party supporters and military and police officers, said the FARC peace negotiator. The FARC adopted Marxism-Leninism and waged war against what it viewed as an oligarchical economic structure with huge disparity between rich and poor and against the political establishment that had formed the “National Front” in 1958 aimed to end La Violencia by alternating Conservative and Liberal parties in the presidency every four years until 1974 when the Liberal and Conservative parties faced off in general presidential elections. The respective party whose turn it was every fourth year of the National Front offered the general electorate a slate of presidential candidates from its own party from whom to choose, and third parties had to run their candidates through either the Liberal or Conservative parties. While the state and varied segments of society branded “Marulanda” and the FARC as bandits, thugs, and subversives, the FARC made inroads in rural areas neglected by the state and eventually in some urban student associations and labor unions. Born at the height of the Cold War, the FARC garnered solidarity from the Soviet Union, Cuba, China and other Communist-bloc countries, and the United States sent military and economic aid to the Colombian government. It is unclear how much material support the FARC came to receive from its international Communist allies, as the FARC prides itself on “self-sufficiency,” and by the 1980s, several smaller Marxist guerrilla organizations vied for international support. However, the FARC landed its greatest combat blows years after the collapse of Communism in Europe and while Cuba was reeling from the loss of Soviet subsidies. But revolutions can adapt and take different approaches, as seen in other Latin American countries, such as in El Salvador where the Marxist former guerrilla movement FMLN moderated after becoming a legal political party, eventually getting elected to the presidency. Russia’s President Vladimir Putin, a retired officer of the Soviet KGB, has become publicly highly critical of the defunct Soviet Union’s founder Lenin. Another FARC peace negotiator told me, “We are not asking for something unreasonable, we just want to see a civilized, fair country that functions well, where everyone can prosper.” He cited today’s Chile as an example, with its social and democratic opening since the end of the rule of military strongman Augusto Pinochet. If one takes the time to read the FARC’s political statements, there are a number of things that mirror planks in the respective platforms of the US Democratic and Republican parties. Before I met with a Colombian former presidential candidate after the 2014 elections, I was asked to write a list of areas of apparent coincidence between the FARC and this candidate—and between the FARC and Uribe, for that matter–and my list had 13 points, including, for example: political campaign reform; fair access to state and public-sector media; safeguards against government misuse of funds; support and incentives for private enterprise, especially for small businesses, with fair regulation; credits, financing, technology and training for rural development; the right to private property; promotion of foreign investment, with safeguards against rapacity; and no “mermelados” (no “marmaladed” or “sweet-greased” politicians). But Uribe warns of the FARC potentially getting elected to power, then supposedly undermining democratic institutions to impose “Castro-Chavismo.” in reference to Cuba’s Castro brothers and Venezuela’s late president Hugo Chavez. It would be antidemocratic to block the participation of peaceful political parties on the “what ifs” of speculation on possible usurpation (which theoretically could come from the Right, the Left or any political quarter), and Uribe isn’t suggesting blocking a FARC political party. But the FARC notes that Uribe’s proposal to bar from running for or holding public office guerrillas involved in war crimes or other forms of violence, apparently including the killing of soldiers in fighting, is a sophism to exclude FARC leaders and the predominant majority of its members from competing in elections. Political scientists and historians say that Colombia’s own particular, idiosyncratic circumstances, social composition, history and culture have a number of differences from Cuba’s and Venezuela’s, and that “Castro-Chavismo” appears to be unlikely to emerge on Colombia’s horizon. And if there were well-founded worries about Constitutional, democratic institutions being at risk, that would be reason to pass laws, reforms or other measures to safeguard the Constitution, correct flaws and obsolescence, and strengthen democratic checks and balances and freedoms. According to public opinion polls, the FARC favorability/approval ratings are in low single percentage digits–which the FARC disputes, citing questions of polling methodology and other variables—and pundits dismiss as highly remote the chances of the FARC being elected to the presidency in the foreseeable future. But Uribe was polling at around two-percent approval when he started his victorious presidential run for the 2002 elections. When asked in opinion polls if one is for peace, the vast majority of Colombians consistently respond yes—though not necessarily via the Havana peace negotiations, with at least one recent poll showing a majority of respondents disapproving of the way Pres. Santos is handling them. When asked if one would support a peace accord if that meant impunity, a similar majority says no. Polls show that the predominant majority of those surveyed want FARC leaders to spend at least some time in jail and not be allowed to be elected to Congress, the presidency or any public office. The FARC rejects these premises as non-starters and dismisses the polling about these premises and other polls that put the FARC approval rating in low single percentage digits as being stacked against the FARC in a “rigged” context where people recoil at FARC war actions portrayed by “biased establishment media” which the FARC complains hasn’t reported fully and fairly the FARC’s side of the story. Arguing that armed rebellion isn’t justified, the Colombian government and others say that there has been enough democratic opening in Colombia for the FARC to lay down its arms–as other leftist guerrilla and rightist “paramilitary” vigilante groups have done over the past 25 years–and that the “armed struggle” is only adding to suffering, poverty and social injustice in a country exhausted by violence. “I say, those who don’t believe in the armed struggle, man, let’s help to create the conditions so that it isn’t necessary,” said “Timochenko” in his SEMANA interview. Like many sectors spanning the Colombian political spectrum which don’t espouse “armed struggle,” the FARC complains that the political, social and economic playing-field is tilted steeply in favor of powerful big-money interests, elites, “political machines,” and entrenched clans at local, regional and national levels, which dominate media, institutions, and commerce. The FARC stresses that when it tried to participate in electoral politics in the 1980s as part of its first of its several attempts at peace negotiations, leaders and up to some 5,000 members of the Union Patriotica political party (UP), which it supported, were murdered by “paramilitary” forces and elements of the state security organs, and that there are still cases of government troops or bands linked to them killing civilians either suspected of being guerrilla sympathizers or simply as “false positives” passed off as “guerrillas” to get ill-gained rewards and merits. The Colombian government retorts that over 1,000 “false positive” complaints were made to Colombian appropriate authorities during the past dozen years or so (the non-governmental organization Human Rights Watch says there were as many as 3,000 cases between 2002 and 2008), that there have been over 100 convictions, and that the Colombian government condemns massacres and crimes on any strip and that it is pursuing justice. The Colombian government–along with victims’ rights groups and others–say that to this date the FARC, the ELN and an assortment of past demobilized left-wing guerrilla and right-wing “paramilitary” movements haven’t completely faced up to their respective killings and kidnappings of political figures and thousands of people. The FARC says that the time for that is in a Truth Commission and the Special Jurisdiction for Peace that it and the government have agreed to in the peace negotiations and which is to start taking effect after an overall peace accord is signed.